We’ve heard of breakfast for dinner, but ice cream for breakfast—in January, no less? 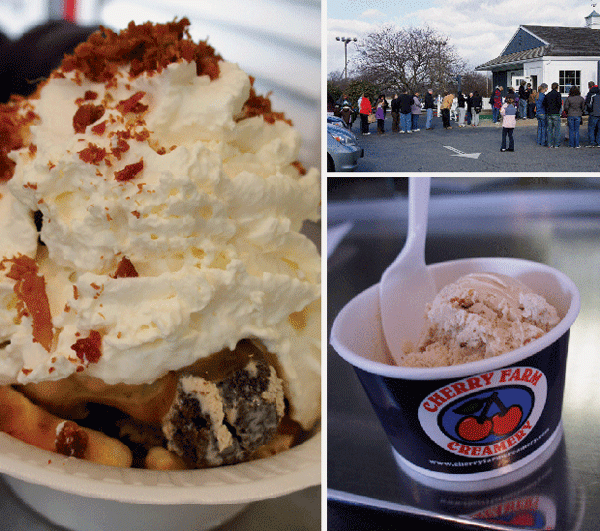 Still, it was for a good cause, so off we went to Cherry Farm Creamery in Danvers this weekend. They were celebrating National Ice Cream for Breakfast Day (who knew?) by serving special flavors on Saturday morning and donating half of the proceeds to the HAWC organization. The creamery went all out for the event, making fresh waffles for waffle sundaes and coming up with great flavors like banana grape-nut and maple bacon, so we were glad to see a line out the door when we arrived. Yes, it was chilly, but it was also fun and thought-provoking. The maple ice cream with real bacon crumbled in was especially interesting, with a strong maple flavor mixing with that wonderful salty element.